The first chapter of Malachi is a relentless barrage of accusation coming from God, hammering his audience with his contempt for their hypocrisy. It’s tough stuff, and the easily offended would be, well, offended. But it’s stuff that they needed to hear, because the church leaders and church-going Israelites to whom God is speaking were abysmal in their worship life. And the list goes on through the next two chapters! “I am not pleased with you,” says the Lord (v. 10). God wants the very best from us. He wants us to come to him with the best of what we have. So when the people were bringing their leftovers, bringing their garbage, bringing their least valuable property and offering that to God, he is offended at them. And rightly so! “Try giving gifts like that to your governor, and see how pleased he is!” says the Lord (Malachi 1:8, NLT). Does any of this sound familiar? It does to me. It sounds like all the times I’ve shown up to church and realized that I forgot the offering envelope – not a conscious decision to plan when and how to give, but a simple lack of attention to that part of my spiritual life. It sounds like all the times I’ve sat in church and gone through the motions, but my head and heart are somewhere else entirely. It sounds like the “Junk for Jesus” concept that leads us to pat ourselves on the back whenever we give a worn out, old, or ugly thing to church because we think someone might find a use for it, even though we can’t. What does God say to all of this? Back up to the beginning of Malachi. What does God say in the second verse? 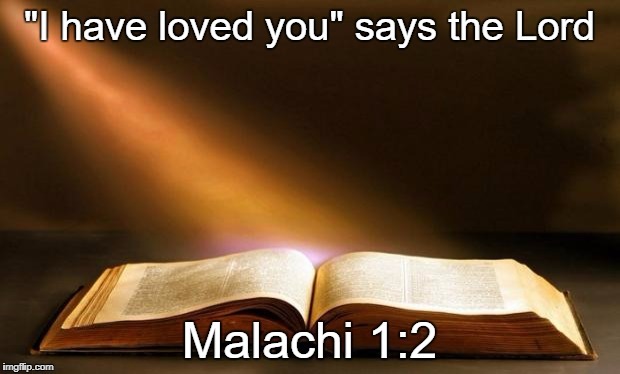 “I have loved you.” Yes, God has some hard things to say to his people. He has hard things to say to us. But he starts with a reminder that his love is sure. That he has always loved us. That he always will. It was not a quiet scene – people crowding against each other, hands raised, clapping, shouting, overwhelming ruckus in exuberant, joyful, rowdy celebration. I might be describing the Rend Collective concert I went to the other night; the description certainly fits. But that’s not the scene I’m thinking of. I’m talking about the streets of Jerusalem the day Jesus rode in on a donkey, and the people hailed him as the coming Messiah. We’re told in the Gospels by men who were there – or who spoke to people who were there – that the people were praising with loud shouts and cheers, waving palm branches and singing. No doubt someone pulled out a zither or harp, some flutes, maybe a few tambourines. There probably people keeping time, stomping their feet or whacking a barrel with a stick. The commotion was enough to upset the devout church leaders, who found the celebration entirely out of place. True, their real beef was that it was Jesus. They didn’t like the people celebrating a man who had become a real thorn in their collective side. But if it had been a quiet celebration, it probably wouldn’t have been so upsetting. It was the fact that so many people were so wildly passionate for Jesus that the Pharisees got so uptight. And how did Jesus respond to their objections? “If they keep quiet,” Jesus said, “the stones would cry out” (Luke 19:40). I don’t know what tone of voice Jesus said that in, but in my head I see the Pharisees shouting at Jesus above the noise, and his face, full of smiles at the people praising him, turns to them in amusement as he calls back a sarcastic retort. This is Jesus full of the glory and the fun, and he’s not going to let anybody rain on his parade, especially not these guys. Now, maybe that’s not exactly how it went down, but here’s one thing I do know: Jesus had no problem with the wild rumpus taking place about him that day. He was delighted to have the people joyfully, rowdily praising him. The only rebuke he would speak was at those who wanted to end the party. 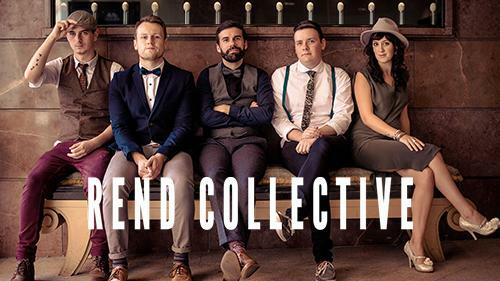 I mentioned that the other night I saw Rend Collective in concert. If you’ve never heard of the group, you are definitely missing out. They are a rowdy Christian band from Ireland, and if anyone knows how to make praising Jesus a wild rumpus it’s these guys. During their first song, Gareth, who usually plays the percussion, was running all over the stage, playing one instrument after another – set, bass drums, chimes, jingling johnny, a garbage can. It was wild. And it set the tone for the whole celebration. That’s what it was – a celebration. Because every song was focused on the awesome grace of God and the power of Holy Spirit that lives inside every Christian. It was a joyful, raucous expression of the faith God has given us. It was delightful. I don’t know if it’s something that I was taught when I was young, or just something I assumed because of the way we do our worship in our churches, or if I’ve just heard more voices in my life emphasize the importance of reverence in worship, but there’s a voice inside me that says that this kind of boisterousness is incongruous with orthodoxy. That to truly worship Jesus we need to be solemn, reserved, or at least just a little more self-controlled. I think that voice is wrong. I think maybe it’s a Pharisee in me that’s rankling at the idea that I could be so passionate for Jesus. I don’t think Jesus accepts our worship any less because it’s a little silly or a wee bit crazy (look, I’m even talking like those Irish guys now…). In fact, I think it puts a smile on his face to see us having loads of fun as we sing about how great he is. Now, I’m not necessarily saying I would like to see our Sunday morning service turn into a wild concert. There are times for reverence and quiet in worship as well. And I’m not necessarily saying that everyone needs to get into dancing and clapping and foot stomping to praise Jesus properly. I know many people who can be filled with inward joy while still being outwardly reserved. But I am saying that both can be equally worshipful, and I am saying that if you are like me and you have that voice inside you that for some reason protests rowdy worship, perhaps that voice is misinformed. To be reverent in worship is to remember that God is so completely other than us, that we are so humbled and awed in his presence that we can do nothing but fall before him and plead his mercy. But to be rowdy in worship is to remember that he is also our loving Father, who loves us and wants to be as close to us as a daddy is to his kids. It’s like the dad who gets down on the floor and wrestles his children, tickling them and tossing them in the air. There’s a righteousness in that rowdiness. We just celebrated Palm Sunday yesterday, and there are so many things to take away from your remembrance of that event. For myself, this year I’m taking away the joy of celebrating Jesus with shouting and cheering, clapping and stomping of feet. After all, this is the King of Kings and Lord of Lords, the Savior of the nations, the Anointed One… and he’s the lover of our souls who came to give completely of himself to bring us to his home. He’s made us part of his family, and he’s promised us a party in heaven greater than any we can throw down here. But maybe we can still throw a party in his honor down here once in a while.